We buy a myriad of cleaning products to clean and disinfect our homes, believing we’re creating a safer, more sanitary, and more comfortable living environment for ourselves and our families. But did you know that some of the chemical ingredients commonly used in these household cleaning products have been linked to both short term issues like headaches and skin irritation, as well as longer term health problems including asthma and cancer? Even if you don’t notice the impacts right away, remember that many of those cleaning products that go down the drain (e.g. toilet, sink and shower cleaners) end up back in our drinking water in trace amounts. These chemicals may make household cleaning quicker and easier, but they are not good for our health or the health of the planet. In this age of super-consumption, marketers have trained us to seek out the brands that that deliver superlative benefits over the competitors…”the tightest ship in the shipping industry”, “the ultimate driving machine”, “the greatest show on earth”, “the best a man can get”. We purchase these items thinking we are getting the most for our money, which will better our lives in some way. Sometimes more is not more. Consider household cleaning products. “Industrial strength” is one marketing-infused brand attribute that suggests cleaning products will make our homes cleaner and that the job will be done faster, or cheaper, or all of the above. “Industrial strength” tells us the cleaning product is so strong that it really doesn’t belong in our homes. As consumers we are driven to want such products simply because we’re technically not supposed to have them! At least according to the marketers. The truth is many ingredients in the common household cleaning products we’ve grown to trust are harmful to our health. As consumers why would we want such products around us, our families or our pets? 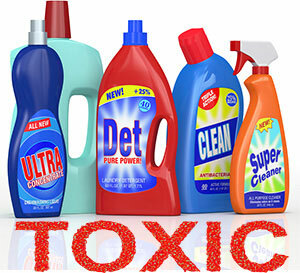 The problem is, most consumers aren’t aware of the hidden dangers these popular cleaning products present to our health. Nor are they aware how pervasive these health threats are. Most products bear the warning “Keep Out of Reach of Children” in bold type on the label. As consumers, we believe that if our children don’t ingest these products they will not be harmed by them. Consider though that the most common methods of exposure are through the skin and respiratory tract. Children are frequently in contact with the chemical residues housecleaning products leave behind, by crawling, lying and sitting on the freshly cleaned floor. Children, especially infants and toddlers, frequently put their fingers in their mouths and noses, increasing risks for exposure. When infants eat solid food, how common is it that the food is placed directly on a high chair tray that has just been wiped down with a household cleaner or dish detergent? Another factor is that, pound for pound, children’s exposure levels are higher than adults’ because, although the amount of chemicals in an exposure remains equal, children’s bodies are smaller so the concentration is stronger, essentially. Also, their immune systems are still developing. Thus, children are probably the highest risk population for chemical exposures through cleaning products. For many of these same reasons, pets may also be at risk. Other populations with a pronounced risk are breast cancer victims, the elderly, asthma and allergy sufferers and those with compromised immune systems. You may be thinking that the diluted aspect of off-the-shelf cleaning products reduces or altogether eliminates the threat of getting sick from your floor polish, window cleaner or air freshener. 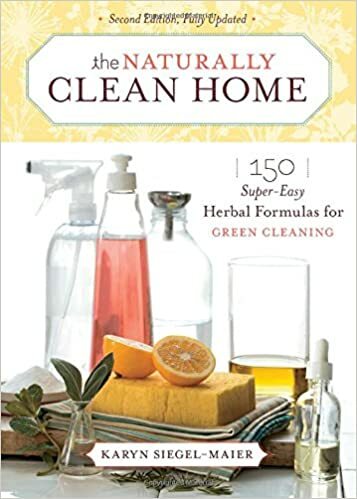 However many of the toxins found in these products (and so many other cleaning products) are bioaccumulative, meaning the chemicals do not purge easily from the body and over time even mild exposures can add up to toxic levels. In fact, a medical study recently conducted in Iowa suggests a correlation between certain occupations and bladder cancer. One of those occupations was cleaning services. These products are used repeatedly and routinely in the home to maintain cleanliness, increasing the chances for bioaccumulation of chemicals in the body. What’s Lurking Under YOUR Kitchen Sink? Research points to the toxic effects of not only active but also inactive ingredients – hazards that can affect the central nervous system, reproductive systems and other vital bodily systems. Consumers often don’t have the time or know where to go to find important information about the products they use. To make matters worse, the information is often presented in highly scientific language that may be difficult to interpret. But there are a growing number of consumer-friendly resources that can help us sort through all of this information and understand what we need to know to make the best possible choices for our families with regard to household cleaners, disinfectants and polishes. Carcinogens– Carcinogens cause cancer and/or promote cancer’s growth. Endocrine disruptors – Endocrine disruptors mimic human hormones, confusing the body with false signals. Exposure to endocrine disruptors can lead to numerous health concerns including reproductive, developmental, growth and behavior problems. Endocrine disruptors have been linked to reduced fertility, premature puberty, miscarriage, menstrual problems, challenged immune systems, abnormal prostate size, ADHD, non-Hodgkin’s lymphoma and certain cancers. It can be cumbersome and time-consuming to research all of the ingredients in the cleaning products under the kitchen sink. In general however, product warning labels can be a useful first line of defense. Cleaning products are required by law to include label warnings if harmful ingredients are included. Even products with a cautionary label, it should be pointed out, may present health risks if used improperly or with repeated exposures over time. Good ventilation and skin barriers are very important when using any over-the-counter cleaning product. We are exposed to countless chemical ingredients in daily life that may be harmful to our health – too numerous to outline here. Pesticides. One of the most counter-intuitive health threats is that of products that disinfect. Common sense tells us that killing household germs protects our health. However disinfectants are pesticides, and the ingredients in pesticides often include carcinogens and endocrine disruptors. 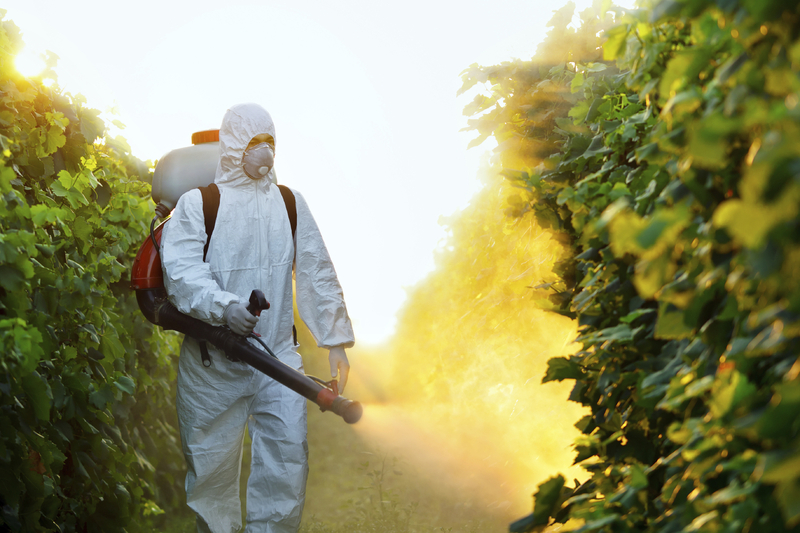 Pesticides are fat-soluble, making them difficult to eliminate from the body once ingested. Pesticides, including disinfectants, may also include alkylphenol ethoxylates (APEs). APEs. APEs act as surfactants, meaning they lower the surface tension of liquids and help cleaning solutions spread more easily over the surface to be cleaned and penetrate solids. APEs are found in detergents, disinfectants, all-purpose cleaners and laundry cleansers. They are also found in many self-care items including spermicides, sanitary towels and disposable diapers. APEs are endocrine disruptors. Formaldehyde. Formaldehyde is commonly known as a preservative. Many people do not know that it is also a germicide, bactericide and fungicide, among other functions. Formaldehyde is found in household cleaners and disinfectants. It is also present in nail polish and other personal care products. Formaldehyde is a carcinogen. Organochlorines. Organochlorines result from the combination of hydrogen and carbon. Some types are highly deadly, such as DDT. OCs are bioaccumulative and also highly persistent in the environment. OCs are present in pesticides, detergents, de-greasers and bleaches. OCs are also present in drycleaning fluids. OCs are carcinogens and endocrine disruptors. Styrene. Styrene is a naturally occurring substance derived from the styrax tree. Styrene is most commonly used in the manufacture of numerous plastics including plastic food wrap, insulated cups, carpet backing and PVC piping. Styrene is also found in floor waxes and polishes and metal cleaners. Styrene is a known carcinogen as well as an endocrine disruptor. Exposure may affect the central nervous system, liver and reproductive system. Phthalates. Phthalates are most commonly used in the manufacture of plastics. Phthalates are also used as carriers for perfumes and air fresheners and as skin penetration enhancers for products such as moisturizers. These chemicals are classified as inert and as such no product-labeling requirements exist for phthalates. They are endocrine disruptors and suspected carcinogens. Phthalates are known to cause hormonal abnormalities, thyroid disorders, birth defects and reproductive problems. Volatile Organic Compounds (VOCs). VOCs are emitted as gases suspending themselves in the air. VOCs include an array of chemicals, some of which may have short- and long-term adverse health effects, and are present in perfumes, air fresheners, disinfectants and deodorizers. VOCs commonly include propane, butane, ethanol, phthalates and/or formaldehyde. These compounds pose a variety of human health hazards and collectively are thought to be reproductive toxins, neurotoxins, liver toxins and carcinogens. Benzene, Toluene, Xylene, Methanol, and Ethylbenzene are chemicals commonly used in disinfectants, tub and tile cleaners, and toilet cleaners. These compounds have been linked to nerve system damage, memory loss, reproductive system damage, and an increased risk of several types of cancer. Bleach is a common ingredient in cleaning products, and many people buy them, believing it is necessary to get household items their absolute cleanest and whitest. But bleach is one of the most potentially dangerous and reactive substances around! When mixed with ammonia and acids it forms toxic gases that are highly irritating to the eyes and lungs. Formaldehyde is used in air fresheners, antibacterial detergents, and carpet cleaners, and is a known carcinogen, or cancer-causing agent, in humans. Fragrance is a general term that can mask the presence of allergens and known hormone disrupting chemicals like phthalates. To demonstrate an idea of how pervasive these substances can be under your kitchen sink, 2-butoxyethanol is a good example. Although the signal word for this chemical is “Danger!”, it is found in no less than 108 household cleaning products as well as countless auto, hobby/craft and exterior home maintenance products, according to Household Products Database from the National Library of Medicine. Synonyms for this chemical include butoxyethanol; butyl cellosolve; ethanol, 2-butoxy-; ethylene glycol mono-n-butyl ether (EGBE); ethylene glycol monobutyl ether; monobutyl ethylene glycol ether; n-Butoxyethanol. This chemical is an organic solvent, and a raw material used in the production of phthalates. According to the Material Safety Data Sheet from one leading trigger spray cleaner degreaser, exposure to this chemical is reportedly associated with chronic blood and bone marrow damage. It affects the central nervous system, blood and blood-forming organs, kidneys, liver and lymphoid system. It is an eye and skin irritant. Exposure is generally through the lungs, skin, and mouth with 75% of total exposure attributable to the skin. Even vapors from this chemical can be absorbed by the skin. Under existing EPA guidelines, this chemical is considered a neurotoxin and a possible human carcinogen and has been found to cause cancer in animal testing. Symptoms of exposure to 2-butoxyethanol include central nervous depression, nausea, vomiting, diarrhea and prominent headache. To avoid unnecessary exposure to this chemical, use rubber gloves when cleaning with products containing 2-butoxyethanol, ventilate the work area well and/or mask the mouth and nose appropriately. More favorably, avoid products containing this ingredient. It is important to stress that even products that may be perceived as healthy because their names include the words “green”, “citrus”, “lemon” or “orange” may contain this ingredient. The best advice is to read the ingredient label rather than trust the product name or marketing language. Another harmful ingredient to watch out for is monoethanolamine, also known as MEA. Other synonyms for this chemical are Ethanolamine; Ethanol, 2-amino-; 2-Aminoethanol; 2-Hydroxyethanamine. This chemical is a surfactant and an emulsifier and can be found in nearly 50 household cleaning products including floor cleaners, tile and grout cleaners, degreasers, stainless steel cleaners and laundry detergents. Additionally, this is found in 100 personal care products listed in the Household Products Database, especially consumer hair coloring products. MEA is also an antihistamine found in several popular over the counter drugs, the sedating powers of which are stronger than many barbiturates. As a cleansing ingredient, MEA is highly corrosive to the skin, potentially even causing bleeding to the exposed area. Inhalation may cause asthma attacks or damage the respiratory tract or lungs. MEA is potentially a neurotoxin. Repeated exposure to MEA can damage the liver and kidneys and has proven toxic in animal lab tests. One leading global chemical company admits the body of available research is insufficient to fully determine the health risks for humans. Symptoms of exposure to these types of substances include headache, backache, stiff joints, nausea, diarrhea, asthma or allergy attacks, dizziness, memory loss, stuttering, premature puberty, low sperm count, reduced motor skills, sudden mood swings, dyslexia, ADHD, anti-social behavior/autism and birth defects, among others. It is truly amazing that all these harmful ingredients are present in products that are supposed to improve our quality of life. 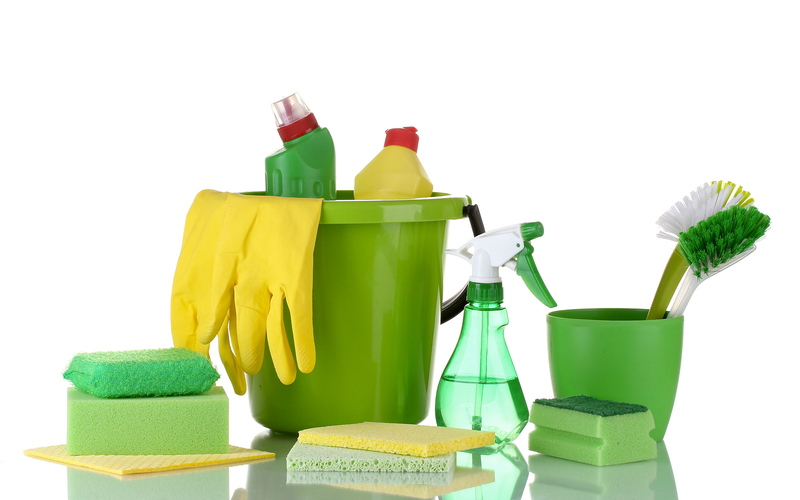 Under the Federal Hazardous Substances Act, household cleaners are the only household products for which manufacturers are NOT required to list all ingredients. Certain ingredients (such as fragrances) are considered trade secrets and government regulations are designed to protect proprietary information. Without full disclosure, consumers can unknowingly submit themselves and their families to unhealthy exposures to these chemicals. Read product labels. Don’t use products with a signal word stronger than “Caution”. Research the chemicals listed on product labels through the Household Products Database, the Cosmetics Database, Toxnet and Scorecard (see inset for web addresses). Avoid products with fragrances. A clean home should smell like nothing at all. Use homemade cleaning solutions made from good, old-fashioned common ingredients such as vinegar, baking soda, washing soda, lemon juice and borax. Interview cleaning services and hire one that is Green Clean Certified. Taking a greener approach to cleaning can help you and your loved ones feel better physically. But you’ll probably also feel better mentally, knowing you are creating a safer environment for yourself, your family and your pets. Although it may feel overwhelming to scan the ingredient label of every cleaning product you bring into your home, in the end, it’s not much different than reading food or cosmetics ingredient labels. The products we use on a regular basis, whether in or on our bodies or in our homes, can have a profound impact on our health. Probably the easiest way to ensure your home cleaning products are safe is to look for natural products from trusted brands. There are a handful of brands committed to ingredient integrity, environmental sustainability, and developing cruelty-free products. 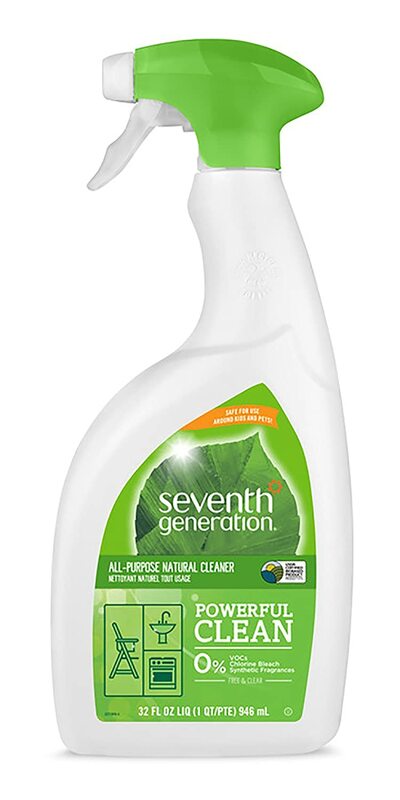 Seventh Generation is probably the most popular and widely available natural cleaning brand on the market. The company is committed to reducing the environmental impact of production, ensuring product safety, and enhancing sustainability. Their products are safe for people, pets, and the environment, and the company fully discloses all ingredients. The company makes a popular line of general household cleaners, including All Purpose Cleaner, Glass and Surface Cleaner, Shower Cleaner, Tub and Tile Cleaner, and Toilet Bowl Cleaner. For those with fragrance sensitivities, look for several of these products in unscented, or “free and clear” varieties. They also make a line of disinfecting cleaners, including Disinfecting Multi-Surface Wipes, Multi-Surface Cleaner, and Disinfecting Bathroom Cleaner, and a line of specialty cleaners for Wood, Stainless Steel, and Granite and Stone. Their Clean Day Counter Top Spray is available in Honeysuckle, Geranium, Lavender, and Lemon Verbena scents. All Purpose Cleaner – look for it in scents like Lemon Verbena, Lavender, Basil, and more. 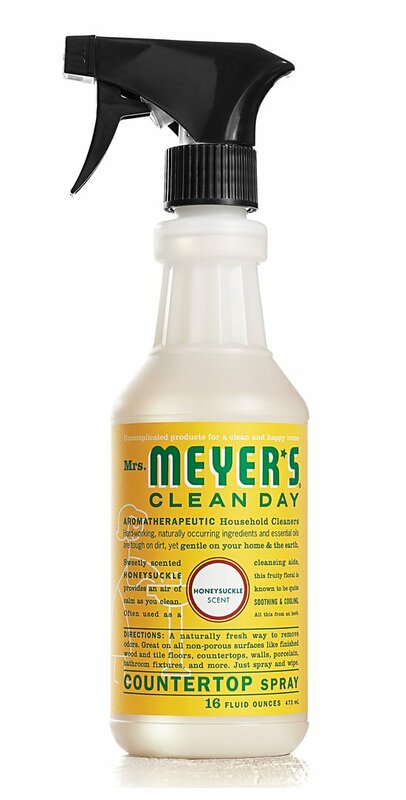 Mrs. Meyer’s Surface Scrub is tough on dirt and grime, but won’t scratch delicate surfaces. Use it on bathroom tile, appliances, and even for pots and pans! Lemon Verbena is the most popular scent, but the surface scrub also comes in Geranium, Lavender, and Honeysuckle. 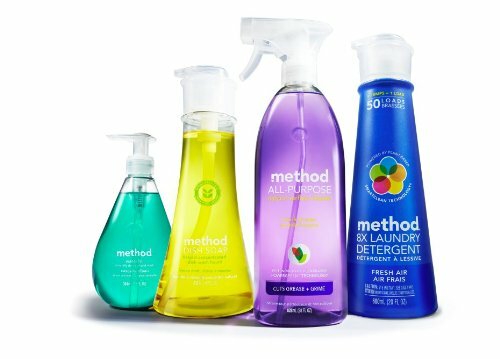 Method produces several types of natural cleaners, each made with biodegradable, non-toxic, and naturally-derived substances. Their packages are 100% recycled and recyclable, and their products are never tested on animals! This is one company that is highly committed to sustainable production practices and ingredient integrity. Look for their All Purpose Natural Surface Cleaner, Glass Cleaner, Wood Floor Cleaner, Furniture “Wood for Good” Polish, and Toilet Bowl Cleaner. These cleaners come in pleasant fragrances like mint, almond, and citrus – no harsh fumes or artificial fragrances here! 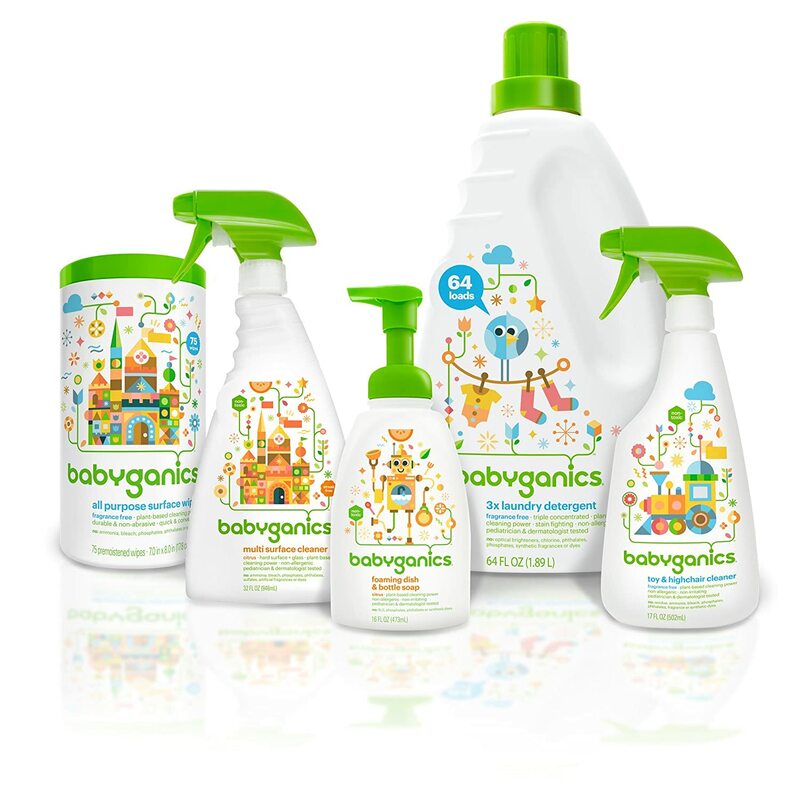 BabyGanics is another great brand offering an extensive line of natural cleaners and bath/body care products. The line was designed exclusively to be safe for the most sensitive populations, including pregnant women, infants, young children, and even pets. All the company’s products are either fragrance free or naturally and delicately scented, with no toxic fumes or harsh residues. Try their Multi Purpose Cleaner, All Purpose Surface Wipes, Toy and Highchair Cleaner, and Tub and Tile Cleaner. Lemon juice and vinegar are great for cleaning windows and cutting through grease, and vinegar is also useful for preventing mold formation. Ordinary table salt (or sea salt) is great for scrubbing and scouring tough dirt and grime, and for helping to disinfect high traffic areas. 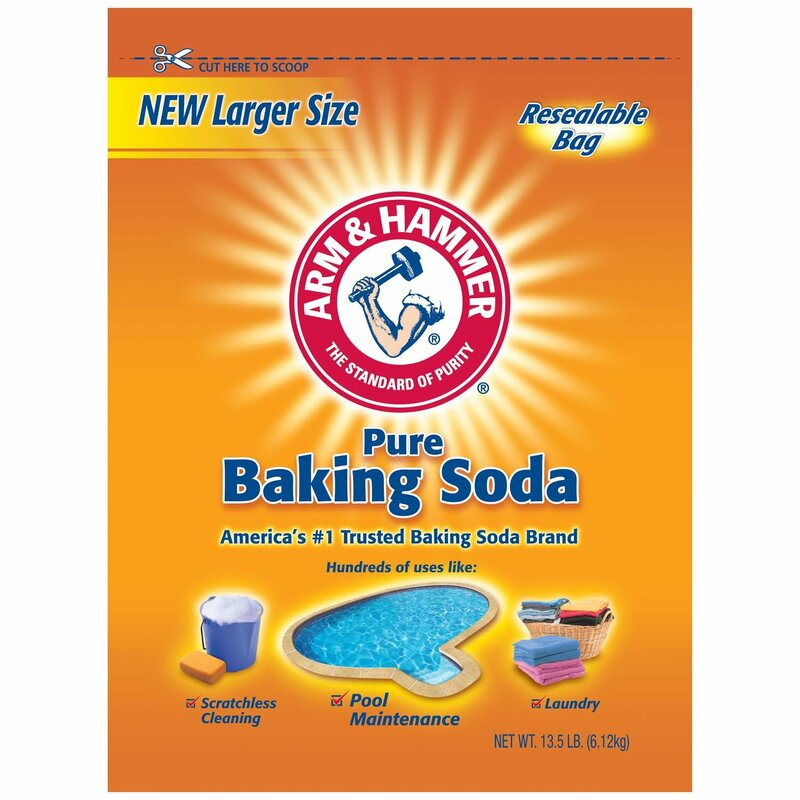 Baking soda is indispensable for natural household cleaning! 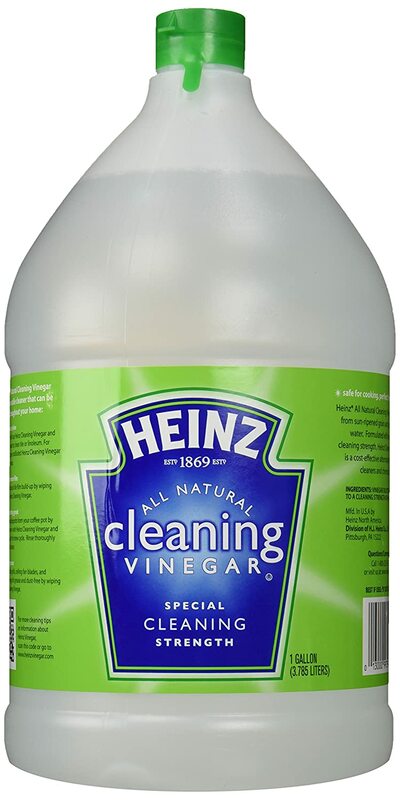 It scrubs and scours, cleanses, deodorizes, and even helps unclog drains when mixed with vinegar. Did I miss your favorite natural cleaner? Or perhaps you have a great cleaning tip to share. I’d love to hear from you in the comments section below! Hands Free Shoes Make Dressing Easier!